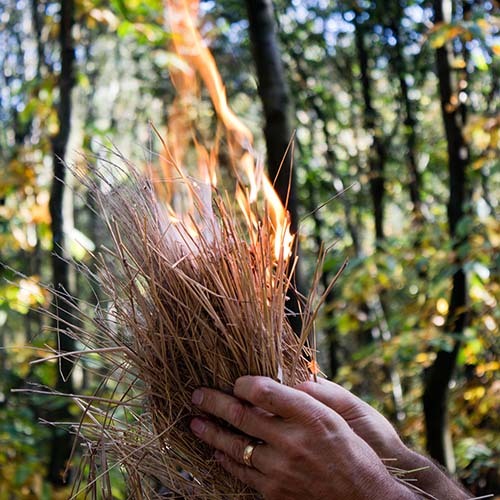 If you have a love of the woodland or forest or are simply curious then you may want to spend a day or more in the woods and learn some bushcraft skills. I have the use of some private woodland near Colchester and also near Clacton. I can also help you to negotiate the use of other woodland that may be nearer to you. If you have woodland near you or are prepared to travel to woodland I can work with various sized groups. Using any of the activities listed above the children can develop ‘personal learning and thinking skills’ as they work together. Many activities can be linked to or enhance the curriculum. For example- the Rope Bridge Challenge covers friction and how to overcome it, mechanical advantage, pulleys, forces, tension and vectors as well as how knots work. If you have mature trees on your school site then this activity can be done there. These are suitable for any age but are understandably popular among children. In a typical 3 hour session the children would work in teams to build shelters, learn fire lighting and build their own fire, cook a meal on a central fire, toast marsh mallows and have a short game. If you have a group of friends who may like this type of experience where the purpose is primarily social, then a bushcraft activity may be what you are looking for. This can be done as a day time, evening or overnight event. I can supply a 3 course meal, cooked on an open fire. Bring your own wine. Build your own shelters, cook a meal and sleep overnight in the woods. Wake up to the ‘dawn chorus’ and a cooked breakfast. Suitable for all ages. Young children need to be accompanied by a parent or guardian Mostly run from May to September but possible in the colder months for those who are suitably equipped. It is my experience that people with behavioural problems or mental health issues are usually far more relaxed when outdoors in the woods or open spaces, creating opportunities for openness, discussion and a ‘breathing space’ from the stress of normal life. As a team leader or manager you may want to consider taking your team away for a day or two. A bushcraft experience can be a great ‘leveller’ and provide opportunities for team bonding and development. Depending on what outcomes you are looking for I can design an experience for your staff that will help to strengthen the team as they solve problems and face challenges together in a totally different environment to normal work. Briefing, reviewing and de-briefing would be part of the experience. 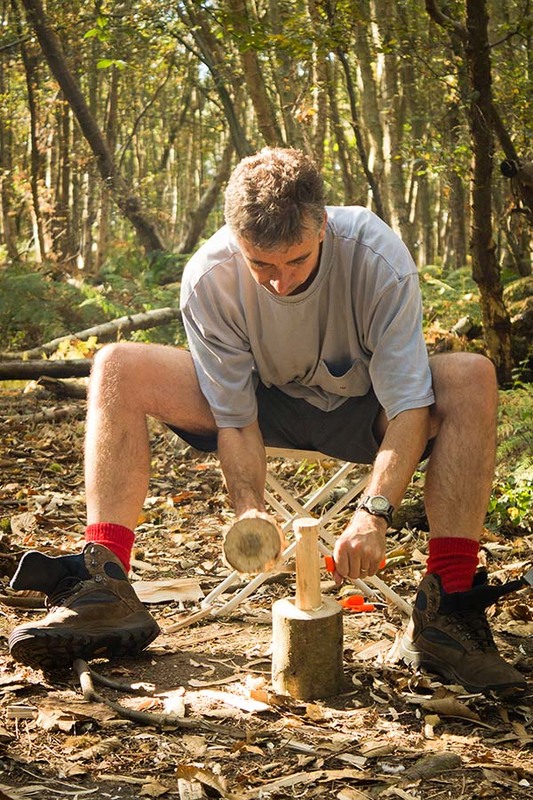 The bushcraft experience can be part of a wider challenge involving some travelling on foot or by boat. These normally run in the Spring, Summer and Autumn. They are a great opportunity for parent/child bonding and for the whole family to work together. A shared experience where adults may be learning as much as the children, helping each other build shelters, light fires and cook food can be great fun and create wonderful memories. The young people I work with had a great time on your bush craft days, Comments from young people, "awesome" "never cooked on an open fire before food tasted great" had a great time making a swing" "best day out ever, when can we do it again" "never been in a wood before thought it was going to be scary but it was amazing, James was really really good taught us how to do things safely" Bush craft adventure day and overnight camp for grand parents and 6 teenage grandchildren. Thank you for giving us such a lovely time in the wood last week. We have had very happy feed back from the children and their parents report that they went home to bed and stayed asleep for most of the day! Just to say a big thank you for giving us the opportunity to hold this event last week - it was a great success. We had eleven youngsters who all had a great time (as did the three adults!). James was great with them and they are now asking to do an over-night session. Thanks. Some comments from a few of the young people: Tom - "A breath of fresh air, both literally and metaphorically. Safe through common sense rather than suffocating health & safety rules" Stephen - "Exciting, fun, free and survival are just some words to describe this amazing day" Matt - "I really enjoyed the day out. I learnt how to light and cook on a fire. Great experience for everyone" Alex - "It was a great experience and great fun. An amazing day out " Jade - "I had a really good day & learnt a lot. My favourite part was making our own fire" Jacob - "Our day was fantastic. Basic survival is fantastic. One word for the whole day is superb?